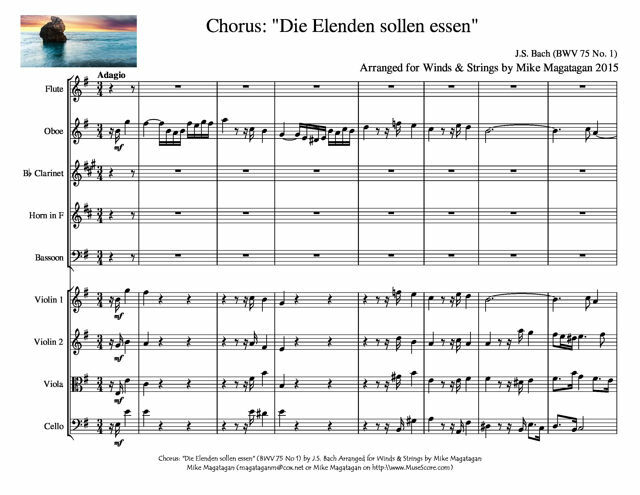 Die Elenden sollen essen (The miserable shall eat), BWV 75, is a church cantata by Johann Sebastian Bach. Bach composed the cantata for the First Sunday after Trinity and first performed it in the service in the Nikolaikirche on 30 May 1723, to take up his position as Thomaskantor. From then he was responsible for the education of the Thomanerchor, performances in the regular services in the Thomaskirche and the Nikolaikirche, and until 1725 also for one of two services in the Paulinerkirche. He started a project of composing one cantata for each Sunday and holiday of the liturgical year, termed by Christoph Wolff "an artistic undertaking on the largest scale". The autograph score is written neatly on non-Leipzig paper, probably while Bach lived still in Köthen. A Leipzig chronicle, "Acta Lipsiensium academica", reported the social event: "... führte ... Hr. Joh. Sebastian Bach ... mit gutem applauso seine erste Music auf" (... performed ... with good applause his first music). "Good applause" means "great approval" rather than clapping of hands. A different translation renders the note as "... the new Cantor and Director of the Collegium Musicum, Herr Johann Sebastian Bach, who has come hither from the Prince's court of Cöthen, produced his first music here with great success." 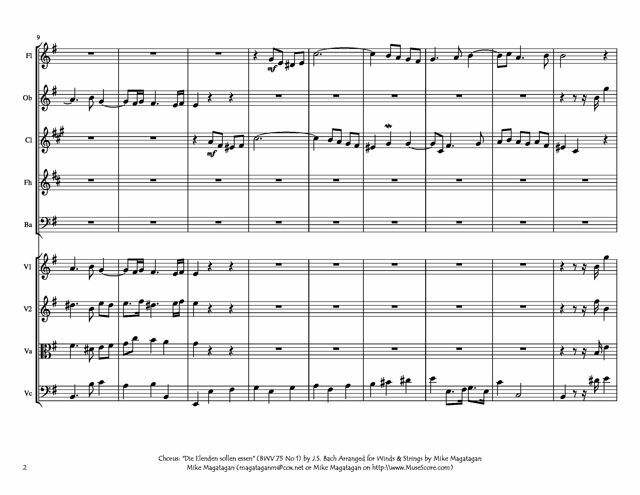 Bach marked the occasion, creating the opening chorus reminiscent of a French overture, with a slow first section in dotted rhythm and a fast fugue. He chose the same form one year later to begin his second annual cycle with the chorale cantata O Ewigkeit, du Donnerwort, BWV 20. The composition can also be seen as a prelude and fugue on a large scale. The prelude is again in two sections separated by a short interlude, in the way of a motet according to the different ideas of the text. In the fugue on the words "Euer Herz soll ewiglich leben" (your heart shall live for ever), the subject is developed three times, again separated by interludes. 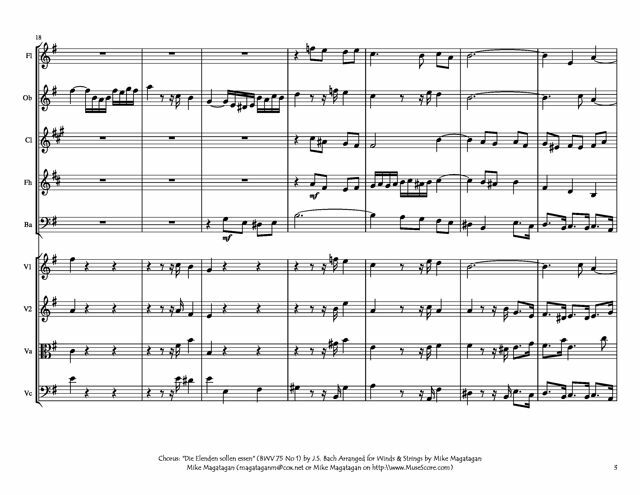 Although originally scored for four vocal soloists (soprano, alto, tenor and bass), a four-part choir, trumpet, two oboes, oboe d'amore, two violins, viola, and basso continuo including bassoon, I created this arrangement for Winds (Flute, Oboe, Bb Clarinet, French Horn & Bassoon) & Strings (2 Violins, Viola & Cello).